The opening montage shows the titular heroine collects Amelia Earhardt and Eleanor Roosevelt clippings (were there any of Katharine Hepburn? ); she wants to be a journalist herself and so marches down to the Cincinnati paper’s city desk to give them her Great Story on the Chicago World’s Fair (I saw a budding Camille Paglia … or maybe Mary Richards). She begins as an upper-middle-class girl, but the film follows her through a year of the Depression, beginning as something that affects others, but then affects her. Her daddy has to leave for Chicago to get a job (after a shocking scene of recognition), and her mother has to take in boarders. One of the most effective things about KIT KITTREDGE, in fact, is the way the parents shield the precariousness of the family’s condition from Kit for so long, giving what might seem like hairpin plot turns a certain logic, looking back in retrospect. The idyll of Kit’s girls club broken up, she makes new friends based on the boarders and the hobos who hire themselves out for food. A crime takes place that hits close to home and Kit Kittredge, Girl Detective, has to figure it all out. She’s the sort of assertive pre-feminist girl that’s the ideal protagonist for this sort of movie — fundamentally an adventure fantasy about a plucky girl, with some (but not too much) edge, difficulty, topicality and moral worth. There’s no po-mo winks, congratulations to the audience for being born later, or anachronistic snarkiness. Hunter is not wrong in his description, though his review is generally a comedy of errors: the Reductio ad Stalinum was a hoot; and the supporting characters are anything but “bland,” if anything, they could be criticized as too one-note “quirky” (Stanley Tucci as “magical”; Joan Cusack as “dotty”; Jane Krakowski as G-rated “trampy”). But y’know what … I don’t think a child’s adventure movie should have “truly dangerous” characters. In a kid’s movie, some “sanitization” is essential: a kid’s movie set in the Depression neither is nor should be GRAPES OF WRATH, LOS OLVIDADOS or THEY MADE ME A CRIMINAL. KIT KITTREDGE has a very narrow line to walk, but it does so well-nigh perfectly. On the one hand, the villains need to scare a 10-year-old, but cannot do so not too much. The way the film does this is that once the real villains come along in the third act, they are a bit buffoonish and semi-comical to an adult. And if we were looking for a serious “thriller” or a serious Depression movie, then yes, this would be the awful mistake Hunter says it is. But wasn’t it obvious what sort of movie this is — a sweet, sentimental, fairly-predictable fantasy of detective-lit? Alfred Hitchcock once said he saw his task to be giving audience “beneficial shocks.” That applies in spades to children — it’s fun to be “scared”; violating to be scared. And I’d like to think even the most jaded adult critic is enough in touch with what he liked as a child to be able to judge a child’s movie on the right grounds. I just took a break from writing this review to look back and read a couple of the Encyclopedia Brown books I loved as a boy. To the 42-year-old man whose #1 film for the year is 4 MONTHS, 3 WEEKS, 2 DAYS — yes, they were formulaic (always six pages, with the vital clue presented); yes, they had unthreatening villains (Bugs Meany and Wilfrid Wiggins were mostly bluster); and yes, they were set in an impossibly idyllic Idaville (Chief Brown’s officer never shot anyone or have to shoot one). But I could still see what attracted me to them when I was that age — their intellectual puzzles, the confidence that the clue WAS there, the assurance that Encyclopedia wouldn’t get his throat slashed, the hyper-educated boy as hero, the (apparent) adventure. The best kid’s-lit always has dark undercurrents (and are often extremely, even Grimmly, moralistic), but they are *under*currents and shouldn’t become too rapid. 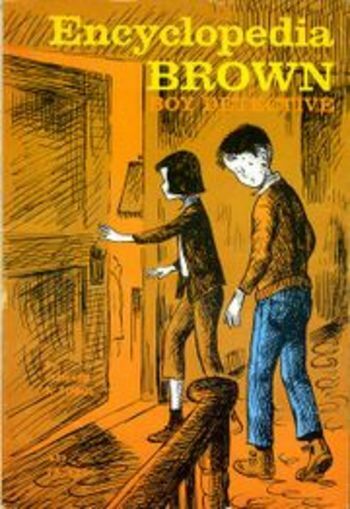 Criticizing ENCYCLOPEDIA BROWN, AN AMERICAN GIRL DETECTIVE for insufficient darkness just seems churlish. 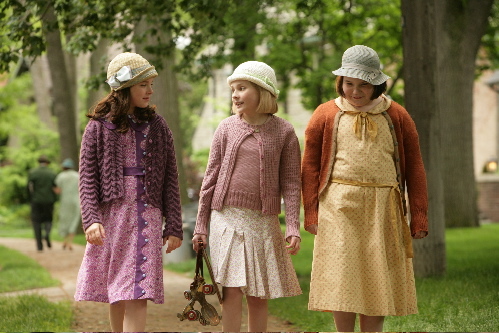 I, personally, would love to see Abigail Breslin in a remake of I AM A FUGITIVE FROM A CHAIN GANG. You’re so right on with this review that I really have little to add, only to say that more of this and less of Miley Cyrus and the other supposed polestars of children’s entertainment would do us all some good. BTW, did you realize Miley’s real name is “Destiny”? Can we get an over/under in Vegas on her first visit to rehab now? Thanks for the review. We’re definitely planning to take our kids to see this. Do you think it’s too much for an almost-4 year old? I’m guessing the almost-7 year old would really enjoy it, as she’s enjoyed others I would put in the same age bracket (Princess Bride is her very favorite movie, and she enjoyed reading The Lion, the Witch, and the Wardrobe–but hasn’t seen the movie). But there is the much more general consideration of whether she’s capable of watching a feature-length movie at a single sitting AT ALL — attention-span, ability to follow narrative, restlessness with a single activity, public demeanor. If she can watch 100 minutes straight through at home, I’d go for it. If not, not.